This is the latest in the BBC Singers single-composer discs, this time devoted to the young British composer Bernard Hughes. On this disc, on Signum Classics, Paul Brough conducts Hughes' Two Choral Fanfares, Three Swans, The winter it is past, The Death of Balder, anyone lived in a pretty how town, Revelation Window and A Medieval Bestiary. Hughes association with the BBC Singers dates back to 2002 when the group performed Three Swans, and subsequently both The Death of Balder and A Medieval Bestiary were commissioned by the BBC Singers. The disc opens with Hughes' Two Choral Fanfares, setting poems by Siegfried Sassoon and Charles Causley, and designed as concert openers; a function which they fulfil admirably. Here we get a good impression of the well made tonality of Hughes style with his appealingly interesting feel for vocal textures. Three Swans sets Stevie Smith, the text of Orlando Gibbons' madrigal The Silver Swan and a riddle from the Exeter Book. The Steve Smith is quiet and thoughtful, rather intense with some highly effective choral textures. The Silver Swan is quite remarkable, as Hughes wrote it without ever hearing the original, and has produced something intense and beautiful, with lovely sustained chords. The Riddle has more of an edge to the harmony, though still a lyrical cast to the writing. There is something very English about Hughes sense of the combination of words and music. The winter it is past is a setting of a Robert Burns poem, equating the passing of the seasons with the end of a love affair. The piece has an austere beauty, with a single line supported by discreet harmony and a very folk-ish cast to the writing. Like much on the disc the music is lyrical and melodic but not conventionally easy. The text of The Death of Balder was adapted by Hughes from Kevin Crossley-Holland's modern re-telling of the Norse myth. The composer describes it as a 'radio opera' with a combination of spoken narration, arias and duets, plus an orchestral background created by the choir. The plot tells the story of the death of the Norse god Balder, orchestrated by Loki, and the subsequent failure to retrieve him from the underworld. The piece is a remarkable combination of speech and sung text, with individual members of the choir taking solo moments. The harmony is sometimes quite spiky, and the whole makes an interesting approach to choral drama. The first act ends with the death of Balder, and there is a lovely keening passage for the choir. The middle interlude sees the gods keeping watch over the body, with the choir providing choral accompaniment to the narrator, before a fully choral texture develops for the gods farewell. Act two deals with the atmospheric entry of the god Hermod to the world of the dead, and Hughes writing here is wonderfully imaginative. There follows the attempt (which fails) to get every living thing to weep for Baldur in order for him to return from the dead. The end is very impressively controlled and sustained sequence which builds to an austerely bleak climax. anyone lived in a pretty how town sets a poem by e.e. cummings, originally written by Hughes as a university graduation piece in 1995 for soprano, baritone and ensemble and re-arranged for choir by him in 2011. The result is a finely crafted part song. Though the fact that copyright reasons prevent the printing of the cummings poem does rather take something from our appreciation. Revelation Window was inspired by the 1995 stained glass window of the same name in Manchester Cathedral. Hughes setting for double choir uses a wordless text whose sounds reference the word for light in various languages. It starts gloriously brilliant and then develops in some remarkable ways, with a sense of anxiety and darkness passing through the light, before reaching a rapturous conclusion. A Medieval Bestiary takes its text from a 13th century bestiary (translated by Richard Barber), interspersed with three Anglo-Saxon animal allegories (in versions by Kevin Crossley-Holland). The starting point was a Folio Society edition of the Bestiary which included both text and illustrations. The music dramatic and striking, certainly not cosily pictorial, but something more. The setting combines solo moments, with spoken sections and beautifully crafted choral settings, the whole keeping a remarkably deft hand on the varieties of texture in the piece. All the soloists on the disc (around 14 different singers in 21 solo roles) are taken by members of the choir, including the mainly spoken part of the narrator in The Death of Baldur. 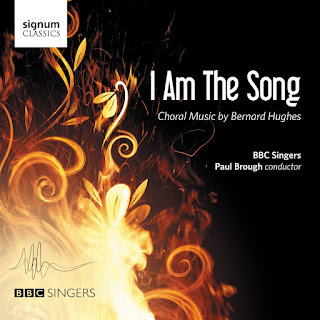 Under Paul Brough's confident direction, the choir give strong performances of the highly varied music on the disc.